How Do I Obtain An Annulment With A Divorce Lawyer In Houston? An annulment can be requested by filing the document entitled “A Suit to Declare Void the Marriage of (Petitioner) and (Respondent).” The spouse who files the annulment is the petitioner, with the other spouse being the respondent. The lawsuit should be filed in the district court located in the country whether either your spouse or you live. Either your spouse or you need to have at least six months in Texas and in the county, you are filing in for 90 days at least. Check with your district court clerk office and ask if they have the sample form that can be used for filing an annulment. Your annulment paperwork will need to list your, your spouse, and any children’s full names. State which of the spouses have lived at least 90 days in the county. List the marriage date and date you stopped living with your spouse. If you have any children and a judge needs to determine child support, visitation, and custody, then that will need to be stated in your suit also. You also need to state whatever property you had and your spouse has and if the court needs to divide it. When you are filing your lawsuit, make sure to get an extra copy that you can serve your spouse with. The district court clerk will explain what options you have when it comes to serving your spouse, which include options when you are unable to locate your spouse or they live out of state. Texas law, unlike a majority of other states, allows spouses that would like to have their marriages void insist on having a jury trial. You will either have a hearing in front of a jury of 12 county residents or in front of a judge, depending on whether your spouse or you want to have a jury trial. You’ll need to prove the legal grounds to the jury or judge for your annulment. If a jury or judge believes you have proven your case, then your marriage is declared void. Whenever a marriage is declared to be void, it’s as if you never had the marriage. Legally, you will be able to say you never were married to your ex-spouse. However, a judge may still determine divorce-related issues in an annulment case just like you were married, including matters such as property division, alimony, child support, visitation, and custody. Children born from a born void marriage are considered to be legitimate, which means they have the exact same rights that children do who come from valid marriage. All legitimate children can inherit from either of their parents and have the right of being financially supported by both of their parents. If you are in need of help with your case and are seeking to nullify something then you want to make sure that you are reaching out to a divorce lawyer in Houston who is more than qualified to help you with your situation. Look for a lawyer or attorney with decades of experience in the arena of services that you seek. 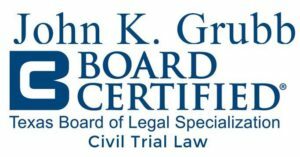 Consider John K. Grubb & Associates as we are an award-winning law firm with many years of experience and influence.